One of the consistent pleasures of reading Clark Quinn’s books is that they are witty, well-researched, and pull no punches in confronting what talent development professionals need to be confronting. 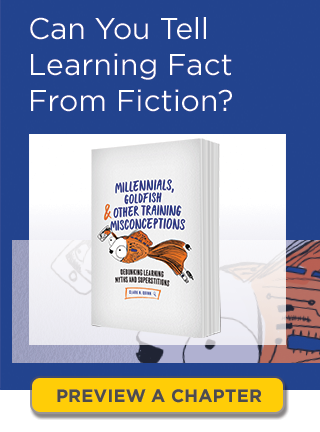 It is an approach that serves him—and us—well once again in Millennials, Goldfish & Other Training Misconceptions, a pithy, helpful, and useful review of more than 30 common assumptions well worth exploring and questioning. His goal in writing the book is straightforward: “…to provide an introduction to learning science and some skills for reviewing materials, as well as a resource to address many of the approaches you may be asked to consider” Building upon research from a variety of sources and acknowledging, in a brief, wonderful “references and resources” section at the end of the book, Quinn has created the sort of well-organized, engagingly written ready-reference book that inspires us to turn to it not only to explore specific learning topics of interest to us, but to treat it as a learning daybook that can and should be perused repeatedly by anyone wanting to remain grounded in approaches to learning that are designed to produce positive, concrete effects among our learners and those they ultimately serve with the learning opportunities we foster. His four-page exploration of the claim that “humans have changed in having the attention span of a goldfish” provides a perfect example of his puckish yet no-nonsense style. He points out that a study upon which the claim was based offers “no citation for [confirming] the attention span of a goldfish that humans were compared to.” (I suspect we’re opening a door here to expanded studies of what the actual attention span of a goldfish is, but that’s probably better left for a different book than the one we are discussing here.) He then, in five paragraphs, tells us “what the evidence says” about our attention spans; reminds us that “attention is too complex to be lumped under a number such as eight seconds” (p. 28); and concludes that “we’re still capable of dedicating the same level of attention we’ve been able to demonstrate for generations”—reassuring news to any of us designing and facilitating learning for learners who are going to be with us (or the online resources we are providing) for more than eight seconds. He clearly remains focused, throughout the book, on the impact our work has on those whose learning we facilitate and those who ultimately benefit from the skills our learners acquire and use in our workplaces: “Our field should have a level of professionalism—we should not be committing ‘learning malpractice.’” He also consistently encourages us to further explore the myths, superstitions, and misconceptions under discussion here in a variety of ways: by reading the resources he provides at the end of each section; by using the “quick guides” at the end of the book if we want a summary of what he has documented; and by joining the Debunker Club to be part of a community of talent development professionals actively engaged in contributing to the betterment of our profession. “Our understanding of learning, though not yet complete, still provides a robust basis for designing instruction—or, more properly, creating experiences that facilitate learning,” Quinn says up front. With this book in hand, we can’t help but take another significant step toward reaching that important goal. Paul Signorelli is a San Francisco-based writer-trainer-presenter-consultant who is active in ATD nationally, regionally, and locally. He is currently writing Change the World Using Social Media for Rowman & Littlefield (projected publication date: winter/spring 2019). He can be reached at paul@paulsignorelli.com and blogs at Building Creative Bridges.